This time next week I will be in Paris! I have begun to pack already. It is very exciting! I am looking forward to strolling down the Champs de Elysee drinking in scenery. I would like to share my French adventure with you all and hence, French Friday will be born and begins next week!!! While I am in France I will be sharing about my trip. When I return I will be having giveaways and free downloads, as well as bits of stories of my trip and hopefully really great photos! (I am frantically reading my new camera's manual!). 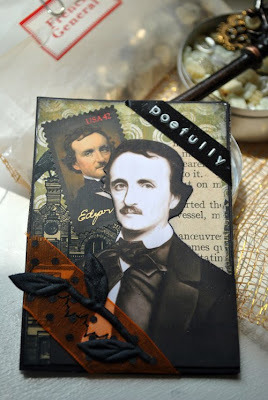 Until then, I am sharing with you all a surprise gift I received from a dear friend Marlynn, who I met right here in blogland. She made this lovely card for me! 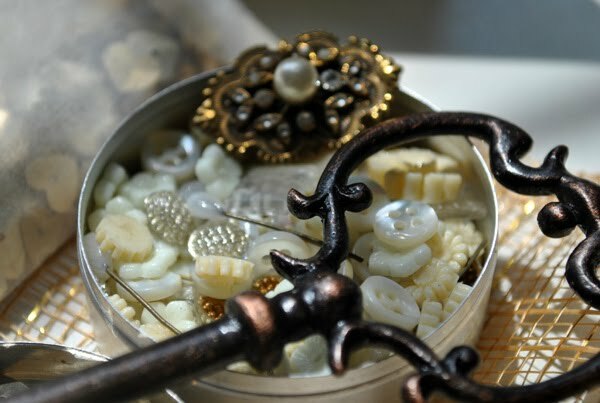 And can yous see in the top most photo all the fabulous bits and pieces of vintage bits and buttons! I just love this little tin of goodies, and what a fab key!!! She sent it all tucked in a gorgeous box. There is even a little bag of vintage heart shaped sequins from French General. I was in shock as I pulled out more and more goodies! She is so talented, and I am always sighing at her ATCs! 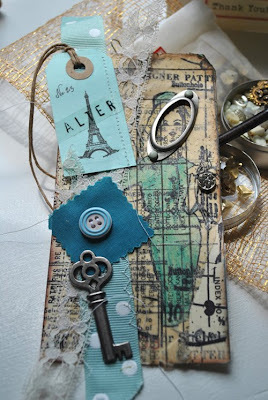 Below is her gorgeous Paris tag. Stop by and visit her at Honeysuckle Breeze. Thank you so much Marlynn, you have inspired me to create! I was also very fortunate to get a swap item from another blog friend Christy, she too is totally amazing with what she creates. Remember my Alice in Wonderland cigar box room? 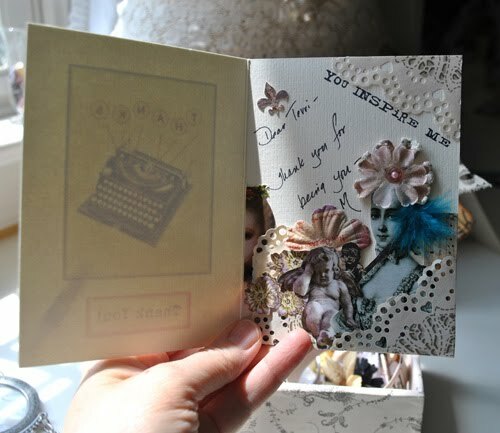 I have sent it off to a secret recipient, and I received one from Christy in return. How fun is that!!! This is her Thumbelina room. I just love her little whimsy girl and her tulle skirt! 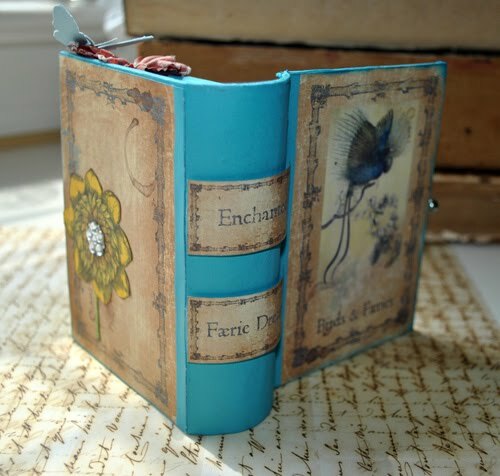 And the idea of putting it in a book shaped box is fab!!! I feel so lucky!!! Thank you Christy!!! 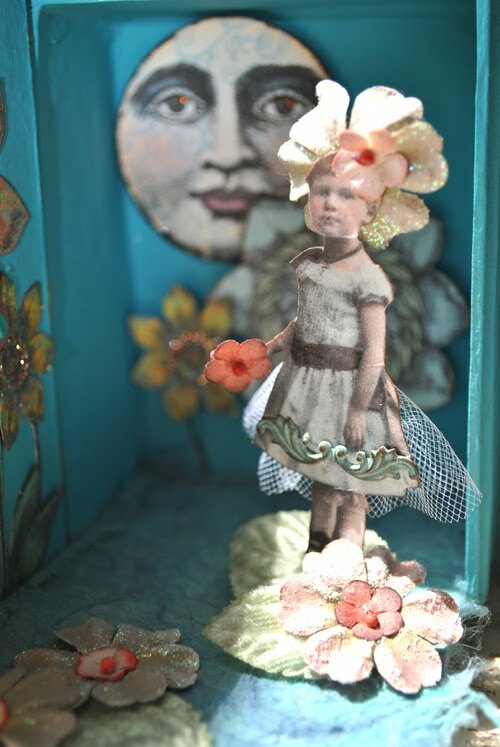 You can visit Christy and her her fab art here at Christine Chronology. A very happy Friday to you all, and don't forget to look for French Friday. I am planning on sharing from Paris, so hopefully by next Friday I will have my 1st post! VEry exciting. I received a gift like that recently from a blogging friend. Aren't these connections amazing? And your surprise is beautiful. Can't wait to check in next friday. Paris, so nice. It's wonderful that you get to visit Paris - the city of lights!! I can only dream of going there; but am looking forward to your French Fridays!! Have fun, take lots of pictures, and live in the moment!!! I hope you have a lovely time in Paris! Take lots of photos so that those of us how are not as lucky can view them on your blog - LOL! I for one, will be living vicariously thru you! Above all, relax and enjoy yourself! I love all your wonderful goodies, what lovely friends you have! Bon Voyage! I wish you a beautiful trip and many memory makers. 'See' you in Paris!! Such eye candy this morning!! WOW!!!! Oh, my, I am just pee green with envy (yep GWTW is my FAVORITE book/movie)!! I am SO looking forward to hearing all about your trip!!!! Oh Paris!! You must be so excited. Your surprises in the mail are amazing. Beautiful gifts from your friends! I'm so excited for you - Paris! I dream of going there. Can't wait to hear about your trip and see your photos! Ohhh wowwww Terri, this is so very BEAUTIFUL. What wonderful gifts and swap items you've received, Terri! Your trip to Paris sounds very exciting! Have a save flight and enjoy your vacation! Terri...have a Fabulous and magical trip! I am happy for you...many blessings!And wow..what abeautiful post..all the photos..and creative surprises..fantastical..beautiful! Have a happy day and gorgeous trip..shine! Paris is such an amazing city, you are going to have the most fantastic time there. All those antique markets and shops, all those fabulous sights to see. I'm really looking forward to seeing the city through your eyes when you show us your photos. I am so excited for you Terri! I know that you will have the most wonderful time. I am anxious to start following your reports next week. I love Paris and have promised to take Bentley there one day. Be sure to take pics of the many dogs. The parisians love their dogs and treat them very well. Bon Voyage Mon Ami!! Your swaps are stunning!! Just beautiful! I am so looking forward to your Paris Posts.. as I just know you will present it so artistically..
Have a safe and happy journey my friend..
Just wanted to let you know that I watched your great tutorial on paper shoes and made some of my own. They are so much fun to create. I put some on my blog. Your tutorial is wonderful and you have such a nice kind way of teaching. Thanks so much. Have yourself a grand French adventure! Terri, I am so excited for you! OH my gosh I wish I could be a little bird watching you in Paris!!! I am looking forward to reading all about and seeing your awesome photos!!! Get reading girl..lol.. I love your gift from Marlynn, she is so darned sweet and talented. Love your PW giftie from Christy, beautiful. Dear Terri, I am so happy for you to travel to your dream spot! I will live vicariously through your travels and tales on French Fridays!! Will this be your first visit to Paris? Do you have a list of all the things you want to see/do, so you don't forget any of them? I'm looking forward to seeing pics of your holiday - I love seeing how other people see Paris! Oh you lucky girl!!!!! I Dream of Paris! maybe someday ,until then I'll just enjoy what you share on your blog. What generous friends you have! OH Terri, how fun, I am so jealous you are going to France. Can't wait to see your posts. Have a wonderful time. And how lucky are you, you really were spoiled by all the lovely art you received, just love it all. Have a wonderful time, I know you will. thanks so much for your kind comments. I have really enjoyed getting to know you through your blog as well. all the best to you! I hope you have a great time in Paris - how can you not?! I'm looking forward to your French Friday - I love anything French. While you are in the Champs Elysses, don't forget to see all the beautiful fancies in Laduree - they have to be seen to be believed! Have fun! What a wonderful gift you received - such pretty things - enjoy! how exciting about your trip! 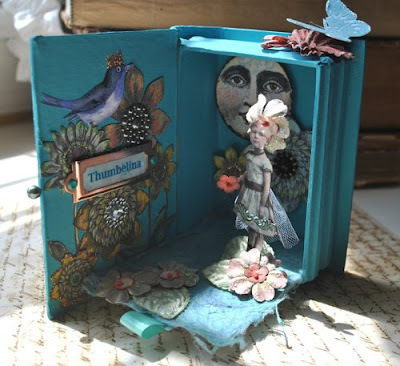 I love all the beautiful art you shared...and Christy's box is just darling! :) I hope you have FUN and safe trip! What a great trip that is going to be, how exciting! 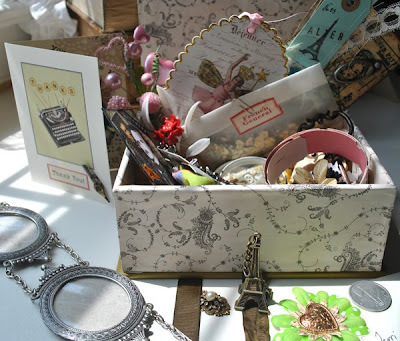 I love your box of treasures, so pretty! French Fridays sound like lots of fun! Have a wonderful time in Paris! In Montmartre you will find so many nice little shops, are you taking an extra suitcase to stock up for your creativity? A notebook to write down your inspirations? Have a fabulous time in Paris!!! Please take along your old camera as a backup (just a suggestion) as it may be verys tressful to learn your new camera and take all the pictures that you want at the same time. I am speaking form a horrible experience with a enw camera and I would hate to see it ahppen to anyone else!!!! I have just found you and I am so glad that I have!!! have a fabulous time and I am looking forward to your Paris posts!!!! I just love Paris, I only wish that we had one last time to visit before we move. Thank you for joining in on the Fab Nest Friday, have a great time next week. Wonderful, Terri! Very exciting trip ahead for you and such a lovely gift also. Do have fun in Paris! Mom just got back from spending 3 weeks there and I love all the beautiful photo's! You have such a gorgeous blog! So happy I found you and will look forward to seeing your post about Paris! I live in France and I hope that you will be enchanted with your visit of Paris. I have just discovered your blog and I am under the charm of your realizations. What amazing talent and swap! Really loved the card!